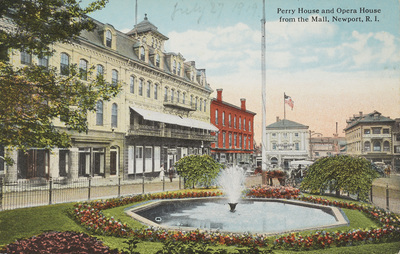 "Perry House and Opera House from the Mall, Newport, R. I." by Danziger & Berman, New Haven, Conn.
Perry House and Opera House from the Mall, Newport, R. I.
Danziger & Berman, New Haven, Conn., "Perry House and Opera House from the Mall, Newport, R. I." (1915). Rhode Island Postcards. 233.